This is the second of a four-series post. In this post: Books that break stereotypes about disabilities & how to recognize ableism in children’s books. In our previous post, we learned the importance of books featuring complex disabled protagonists with agency and power. Later in the series, we’ll see the importance of normalizing and seeing disabled characters as humans, rather than pity-parties. But first: We have an urgent message about the dangers of misrepresentation. Almost all books about disability are written by non-disabled makers. When a maker with power uses their influence to boost the voice of an oppressed minority, that’s awesome. But when a maker uses their loud voice to speak about us, without us, that is a problem. It silences us – not just metaphorically, but pushes down our voices in news feeds, google results, and the queues of publisher manuscripts. The problem is – these voices are always boosted over the voices of a #ActuallyDisabled people who have a perspective on their own experience that outsiders don’t. Non-disabled ‘experts’ don’t live this experience every day. They don’t know what it feels like to be poked and prodded and analyzed. They aren’t judged for having sensory meltdowns in the grocery store. They haven’t faced a million questions about an eye patch. They haven’t struggled to hold together relationships with family, friends, and partners when living in an ableist society gets rough. Our publishing industry is supremacist. Disabled people, even disabled academics and disabled parents, have to prove competence before we are believed over the voices of our non-disabled counterparts. That is completely messed up. Our cognitive, physical, and intellectual disabilities do not render us incompetent. Non-disabled voices are accepted as superior, more convincing, more trustworthy – regardless of how much experience or education they have with disability. The books we’ve been reading our children are violently dangerous. These faux-science, innocuous books full of adorable illustrations insidiously paint us as ‘the other. When we see someone as the other, it’s easier to stop listening to them. It’s easier to downplay their pain and oppression. It’s easier to deny their rights. It’s easier to segregate them, force them into institutions, sterilize them against their will, take their children away from them, selectively abort, abuse, and kill them. It is socially acceptable to talk about disabled people in ways we would never talk about other targeted groups. It’s legal to do things to disabled folks that would be considered inhumane and cruel on a non-disabled person. In our culture, to be disabled is a flaw – a flaw that makes us second-class citizens, less than human – the throwaways to be hidden and culled. When I talk about the urgent problem of misinformation in kids books, non-disabled people never understand why this is such a big deal. They don’t know the history of murder, abuse, and violence against disabled people since the beginning of humanity that continues today in our own neighborhoods. From the moment my son was born, I knew if I say the wrong thing, if I anger the wrong people – will they take my children away. Those first days in the hospital with my newborn, I knew I would have to constantly be on guard. I’m autistic. All it takes is one doctor, one teacher, one judge who doesn’t understand what autism is to declare me unfit. Because of books like these, because of misinformation even in the upper echelons of education, doctors, teachers, disability ‘specialists,’ and members of judicial system have no idea how competent we really are. Please, I’m begging you – this is urgent. We need to fight this. We need to listen to disabled people. Center on a disabled character in their own voice. Are created by makers who are actually disabled, or who extensively consult with actually disabled adults. Back up statements with data-based facts and refute myths and stereotypes. Give voices to non-disabled characters who talk about their weirdo disabled friend/brother/classmate. We have so many books narrated by service dogs – and so few narrated by blind protagonists. We’d rather trust and listen to the voices of IMAGINARY DOGS than actual Blind people. WTF. [Problematic: ‘Looking Out For Sarah,’ ‘Lola And I‘]. Are created by non-disabled ‘experts’ (usually self-proclaimed ‘warrior parents’), educators, or medical professionals who study us like lab mice. [Problematic: ‘My Friend Has Autism,’ ‘In My World‘]. Reinforce myths and stereotypes about our inadequacies with gross generalizations. [Problematic: ‘My Friend Has Down Syndrome,’ ‘All Dogs Have ADHD‘]. My 4- & 6-year-olds ask to read this over and over and over. It’s hilarious. Shane answers the most frequently asked questions he gets about his life with Spinal Muscular Atrophy (SMA), along with hilarious jokes that make kids giggle. ‘Amy, The Story Of a Deaf Child‘ – Although almost as old as me and out of print, is the single best book I’ve ever read normalizing Deaf family life. Amy is a life girl balancing everyday kid stuff with typical accommodations for living in a primarily Deaf family. This book was published in tandem with Amy’s supreme court fight for inclusive school accommodations, which they lost, but set the path for later legislation like the IDEA. ‘The People You May See‘ boosts the voices of people whom kids are prone to staring at. Click here for more images from the book in our exclusive Maker Spotlight with Lisa Koehler. ‘I Have Cerebral Palsy‘ includes photos of a real little girl named Sydney. Her narrative acknowledges that CP is different for everyone, and how this is her personal experience. This doesn’t seem like a big deal, unless you know that 99% of books paint everyone with the disability with a broad brush as if they are all exactly the same. Focusing on the many things kids with CP have with kids who don’t, it prepares friends for common behaviors (slow speech, muscle spasms) without painting them negatively. My Travelin’ Eye is SO GOOD and far more complex than I expected. The author is both proud of her amblyopic (lazy) eye and okay with vision correction (a patch and glasses) to help her see. It’s the perfect antidote to haters who equate disability acceptance with ‘giving up’ – which is pure nonsense. While adults talk over her and see her eye as something to be fixed, Kostecki-Shaw‘s inner thoughts show how wrong they are. Her traveling eye isn’t ‘asleep’ or ‘broken,’ it’s a unique and beautiful gift. We see her grieve the transition from having a unique ability to see and think about two different experiences at once, while reconciling her new ability to focus on just one thing. Although the story is positive, it’s still complex and makes me wonder what kinds of interesting perspectives and ideas the author would have if she had been allowed to let her traveling eye wander. In Jacob’s Eye Patch, we get a taste of what it’s like to face endless questions about a conspicuous disability, and how exhausting it can be to be the target of microaggressions on a daily basis. This story works for more than just visible disabilities. With my 5 year-old, we were able to discuss what it might feel like to be constantly challenged by ‘nice people’ every time we go into public based on what we look like. What very Autistic Girl Wishes Her Parents Knew includes a compilation of articles written by autistic girls, collected and published by the Autism Women’s Network. It’s not a picture book, but it’s so great, every single parent of an autistic child should read it, so I’m including it here. ‘I’ll Tell You Why I Can’t Wear Those Clothes‘ is a workbook helping kids with sensory processing disorders (SPD) and children without SPD empathize with them. The maker took great pains to use sensory-soothing paper, images, and binding, which results in a keepsake book so gorgeous it’s almost too nice to write in. ‘The Autism Acceptance Book‘ is a workbook teaching allistic (non-autistic) children how to understand and support autistic siblings and friends. Caveat: This is comb-bound, which can be painful for people with sound sensory issues. Sigh. 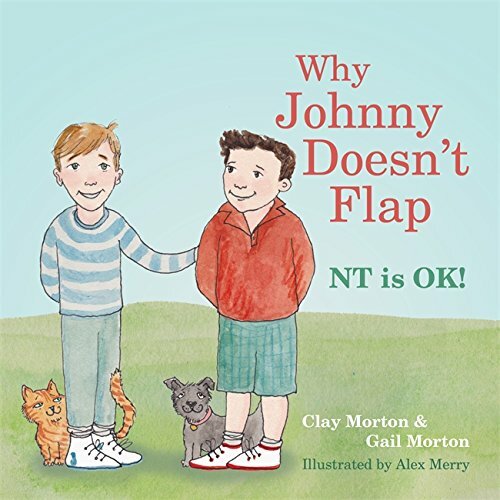 ‘Why Johnny Doesn’t Flap‘ gives non-autistic readers a taste of what it feels like to be treated as inferior because of our neurodivergence. Intended to be a tounge-in-cheek parody of popular kids books, maybe avoid reading it to allistic kids, because it will make them feel deficient. The condescending tone creates a learning device for adults and older kids. And no, reverse-ableism isn’t a thing – non-disabled people aren’t being abused, selectively-aborted, murdered, and forced into institutions because they don’t fit in. ‘Benny Doesn’t Like To be Hugged‘ is centered from a non-disabled girl about her autistic friend, but the overall message is of acceptance. The end-notes, in particular, are a fantastic guide for how to listen to #OwnVoices when you’re writing outside your own experience. ‘Erik The Red Sees Green‘ – Erik’s story of discovery and learning about his color vision disabilities, with end notes about common microaggressions people with color vision deficiency face. ‘Noah The Narwhal‘ – About a narwhal with an invisible disabilities (chronic migraine pain) that flares up without notice – and the way this affects work and personal relationships. Ultimately judgemental folks who don’t understand come around to acceptance. Daniel’s New Friend centers on non-disabled characters meeting a new friend with leg braces and arm crutches. Daniel Tiger is a celebrity (it’s his neighborhood, after all) so it kinda makes sense to center the story on him. This story works for preschoolers and kindergartners who aren’t sure how to treat friends with mobility disabilities (hint: like a regular friend), in a simple story that both includes and respects Daniel’s friend Chrissie’s, including her voice and opinions. ‘Moses Goes To A Concert‘ introduces simple signs in a field trip story while dispelling myths on what Deaf children can and can’t do. ‘Dixie wants an allergy‘ introduces us to a few common allergies. As a side note, it’s also great for introducing how appropriating something that endangers marginalized people for our own entertainment is a jerk thing to do. ‘Keep Your Ear On The Ball‘ centers a non-Deaf protagonist, but addresses common frustrations with the presumption of incompetence, and sets examples for how non-Deaf friends can aid inclusive environments for everyone. ‘My Three Best Friends And Me, Zulay‘ is all over the place (the book has nothing to do with her three friends and tries to cram in three plot lines into one, which is confusing at best), but at least it centers a Blind girl of color. The Princess And The Peanut Allergy validates the experience of kids who have to disclose food allergies, even when it risks facing some fragile lash-back from friends. Beyond disability, this is a spectacular story to introduce the idea of privilege and the aggressive response people face when asking for accommodations (fragility) – or even just educating those with more privilege to inequity. Douglas, You Need Glasses was written for kids who…you guessed it! – Need glasses. It’s a cute story centering on a near-sighted dog that shows the benefits of a visit to the optometrist and picking up some cool new specs. Some funny jokes, an upbeat story, and no judgement. Plus there are cute photos of real kids rocking glasses at the end, to show kids know they aren’t alone. ‘Don’t Call Me Special‘ gently addresses a few of the most common ableist practices that harm disabled folks in ways even a preschooler can understand. I’m not a huge fan of the other books in this series, but this one is solid. ‘Eating Gluten Free With Emily‘ shows us how isolating it can feel to be segregated from social activities because of dietary restrictions (Celiac disease). We also learn how her disability doesn’t define her, it’s just a part of who she is, like freckles and her sense of humor. We also see how adults who don’t take her disease seriously put her in danger. ‘I Know Someone With Down Syndrome‘ Despite the title centering people without Down syndrome (why must non-disabled people constantly center themselves?! ), this was a surprisingly inclusive and respectful intro to the lives of people with DS and takes care not to generalize. Bonus points for photographs instead of illustrations to help kids accept that kids with DSare regular people. The Great Katie Kate Explains Epilepsy’ centers on a non-disabled super-hero but offers more facts and figures for kids who are into stuff like EEG and MRI machines (non-comprehensive, featuring just a few types of seizure disorders). This book is still terrible, and it’s not for kids with epilepsy but it’s the least awful one I could find educating classmates on how to remain calm and compassionate for friends with seizure disorders. I’m still searching for better ones, but for now, weird books about super girls and creepy giant wombats will have to do. ‘Taking Diabetes to School‘ offers an introduction to Type 1 diabetes and shows kids how to identify signs of high or low blood sugar to better support diabetic friends. Caveat: The author ends all of her books with “After all, nobody’s perfect!” which is completely unnecessary and implies that diabetes is a personal flaw. Sigh. ‘I Think I Have The Wiggle Fidgets‘ is the least-terrible books I found on ADHD, but it still focuses on negatives rather than the benefits of ADHD neurodivergence (of which there are many). The maker uses pathologizing language like ‘cure’ (which is a 4-letter word that translates to training similar to gay-aversion therapy, abuse, and selective abortion among disability rights advocates), but in the context of the book the word ‘cure’ is for appropriate accommodations like fidget toys. Because the author has ADHD and I do not, I’m letting this one through because their lived experience counts more than my opinions as an outsider. I was soooo nervous that The Seeing Stick would use blindness as a plot device. And it could be a smidge better – the Blind girl at the center of the story has relatively little agency and power. The real hero of the story is an old Blind man, who manages to traverse the countryside, impress authorities, and educate the Blind girl using the skills he’s learned throughout his life. This story speaks to what many folks in the disability rights movement have been shouting for decades – if non-disabled parents truly want what is best for their disabled kids, they have to listen to disabled adults. This seems obvious, but this is a HUGE issue. Non-disabled parents tend to treat adults with the same disabilities as their kids with disdain and contempt – leaving disabled kids with no mentors to help them navigate an ableist society. This is why disabled kids inherit a hostile environment – non-disabled people just cannot accept that disabled people can be experts on their own experiences. But this book says something few books point out – if you want your Blind daughter to be happy, hire a Blind teacher to help her figure things out. SO SIMPLE. Also these illustrations – holy COW are they gorgeous. There are eve some embossed textures on each page to add some tactile accessibility to the story. YES! GOOD JOB! Check out part 3 of this series to learn the real-world impact of terrible children’s books. Disabled work is work. The burden of educating abled folks often rests on people with disabilities. On top of facing additional barriers to employment and equal pay – and we are rarely compensated for our labor educating, boosting, and supporting non-disabled people. Support my work on Patreon so I can continue to help parents & educators like you raise the next generation of kind & brilliant leaders. You can make BFL accessible for families everywhere and get access to exclusive bonus content that you can’t find anywhere else – every dollar helps. If you are disabled/have disabilities and feel misrepresented in this post, your comments are welcome and I invite your perspective, as the community of disability rights advocates is not monolithic and your perspective matters. Before any non-disabled folks chime in suggesting I switch to person-first language – please don’t pretend it’s just concerned advice. I’ll leave it to you to google how assuming I’m not disabled because I’m eloquent, assuming I’m not disabled enough, tone-policing, and derailing my point is an act of supremacy. I am a right-handed, multiracial, autistic woman and I am not ashamed. Hi Stav! Thanks for reaching out. It’s not ‘bad’ to have books that support family members of people with disabilities. What is a shame is that the number of books written for non-disabled people outnumber books for actually disabled people at a rate much higher than the actual ratio of non-disabled to disabled people – leaving disabled folks erased and under-represented. We have the same issue with under-representing people of color, except the disparity in disability is far, far higher. That said, the erasure of #ActuallyDisabled voices is a problem particularly because when we have lots of people speaking about us, without us, they tend to miss some vital information, and talk about us as if we’re less than human, incompetent, and deserving of pity, rather than respect. For instance – most books are written for non-disabled siblings about what a burden we are, how awful we make their lives, and the resolution of stories like these only works when the non-disabled person does something to go above-and-beyond or justify their existence. This is something that non-disabled people never have to do in stories. While these stories (and the many, many blogs by non-disabled parents talking about how awful life is with us) are validating and should be available, I don’t think they belong a child’s bookshelf, and they should be used with caution. Because if my non-autistic son has a validating book like this to comfort him, what does it mean when an autistic child wanders by and picks this book up. These types of books make autistic kids feel awful – like terrible burdens on the people they love. One of two – in a library, for guided discussion with an adult, or even for older kids, sure. But hundreds upon hundreds, written for young children, and given as gifts to keep in personal libraries, that’s not necessary, and it does real harm. In terms of publishing – if a publishing company only has it in the budget to hire X writers – and they are spending all of this budget hiring non-disabled people to talk about disabled people – that is a BIG problem. This is how silencing a marginalized group works, and how we repeat cycles of oppression. In terms of person-first language, since I’m autistic, and it’s a part of my neurology, I can’t be separated from my autism any more than I can be separated from my other personality traits. Other people on the spectrum feel differently, and particularly those with physical disabilities that doesn’t affect the brain, person-first language makes sense. But since the majority of autistic people prefer person-first language, and it’s mostly non-autistic people who speak over us to insist we should refer to ourselves another way, that is a problem. When a non-autisic person pipes in to tell me that I shouldn’t refer to myself as ‘autisic,’ not only is that person presuming I’m too incompetent to do my own research and come to a logical conclusion on my own, they’re also speaking over me and telling me their non-autistic reasoning is superior to mine, simply because they are neurotypical – that’s supremacy. I’ve had many non-autistic parents/grandparents/aunts & uncles/neighbors of autistic people tell me that I should refer to myself as a person ‘with autism’ despite me assuring them that I am fully capable of comprehending and well-apprised of the reasons for each type of label. By insisting that they know better, and that I can’t possibly be right because my brain is somehow inferior, that’s a clear message that they consider autistic brains inferior.